We have converted the measurements into the metric equivalents for the ease of everyone outside of Amurica. For the Amuricans among ya, buy the cookbook. Its totally worth it. 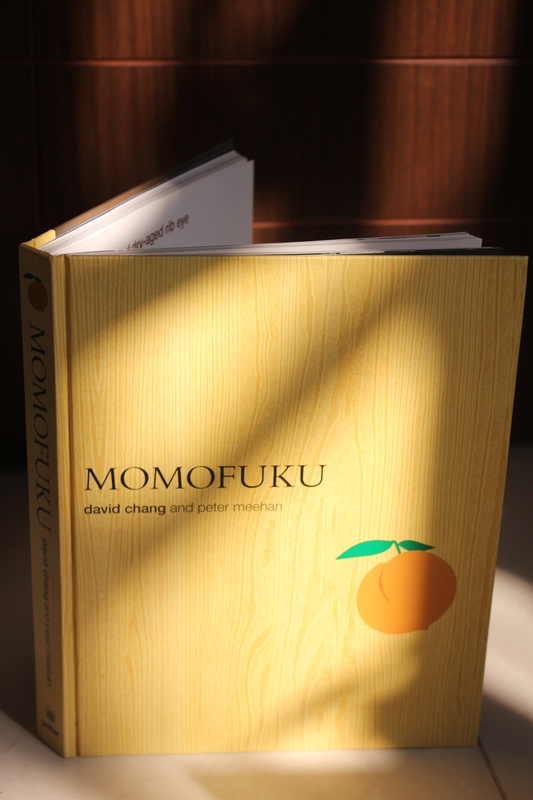 In fact, everyone should own a copy so you can indulge in not only this but his amazing ramen and chicken wing recipes. Go on. Buy it. Heat a cast-iron pan (big enough to fit the meat!) over a high heat. While the pan is heating, season the steak liberally with salt. David Chang suggests “like you’d salt a sidewalk in New York in the winter” so we guess this means quite a lot of salt. Then season with pepper. When the pan is HOT – the steak should sizzle aggressively when it hits the pan – brown the steak. Put the steak in the pan and don’t touch it or press it or anything stupid. After 2 minutes, take a peek – the steak should release easily from the pan and the seared side should be on the golden side of browned. Flip it. Sear the second side for another 2 minutes, following the same program. Stand the steak up with the wide fatty side opposite the bone against the pan for 30 seconds, then trun the steak back over to the side that was seared first is against the pan. Put the steak in the oven and leave it untouched for 8 minutes. Return the pan to the stovetop over low heat. Add the butter, thyme, garlic and shallots to the pan. As soon as the butter melts, start basting; use one hand to tilt the pan up at a 45-degree angle and, with the other hand use a very large spoon to scoop up butter from the pool in the pan and spoon it over the steak. Repeat this motion constantly, cloaking the steak in an eddy of aromatic melted butter. After about 2 minutes of basting, give your pan-holding hand a break and give the steak a poke – it should be squishy-soft, or somewhere close to it. This is the BLUE stage and we’re not providing you with any further details past this point cause quite frankly we like to eat steak that is still moo-ing and therefore you should too. Let the steak rest. DON’T TOUCH for at least 10 minutes. Sort out the rest of your kai. Get out a cutting board and a good knife to slice the meat. Cut the steak off the bone, then slice it against the grain (cutting in the direction that was perpendicular to the bone) into ½ inch-thick slabs. Put on plates and pour any juices from where it rested and the cutting board into the pan drippings. Scatter the steak with more salt and serve with drippings on the side.